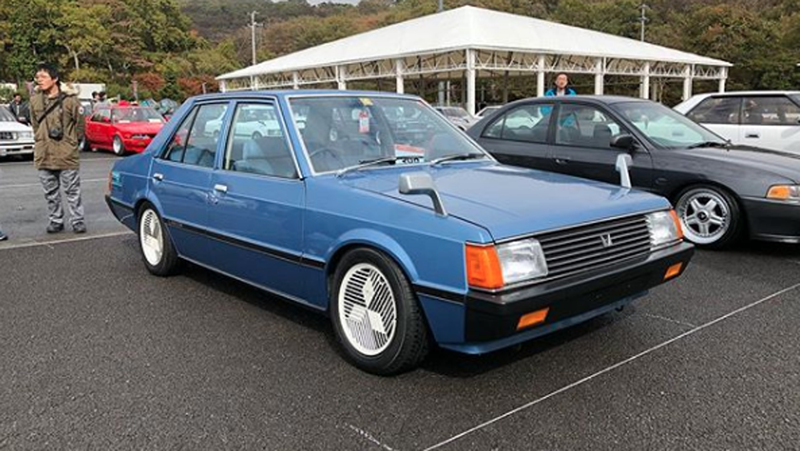 This past weekend was the Hachimaru (eight-zero) Meeting at Fuji Speedway, for 1980s cars and anything else Radwood-era. I poked around on a few tags on Instagram when I found the image above, and my mind has been blown since. The car in question is a Mitsubishi Lancer EX, the generation of the car sold from 1979-1987. It was a pretty conventional front-engine/rear-wheel drive compact car, though enough that the Turbo model did rally duty for Mitsubishi in its pre-Evo days. I have looked through brochures and fan pages but I have not seen these wheels anywhere but on this one blue sedan at this one retro meeting. I want to know more. I must know more. I will not rest until I know more.